Managing and motivating teams can be tough. Staff can be demanding. Colleagues fall out. Sometimes teams simply don’t gel together for no known reason. Some managers don’t ‘get’ why their staff don’t do what they want, in the way they want it to be done. Some individuals think their manager is unable or unwilling to communicate with them. Many of us steer clear of those who we find ‘snappy’ or ‘yappy’. We are all incredibly complex as people. In work this can have a huge impact upon productivity, team effectiveness, client and team relationships and employee morale. But all is not lost, our fascinating Colourwise workshops can help address any of these issues, and have been described time and again as truly eye opening! A Success Insights personality profile is completed online by each delegate prior to the workshop. We also offer single Success Insights Personality profiles and can include one-to-one feedback if required. This may be a better option if only one or two people in your organisation what a profile, or you need to use the profiles on a ongoing basis (i.e. for new starters). 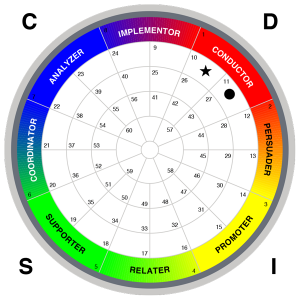 For more information visit our profiling and assessment page or you can purchase individual Colourwise personality profiles from our store.